Before you hit the road this summer, make sure your vehicle is road trip ready so you can have any problems fixed before you go. A pre-trip vehicle checkup will help avoid the inconvenience, potential safety hazards and unplanned expense of breaking down miles away from home. 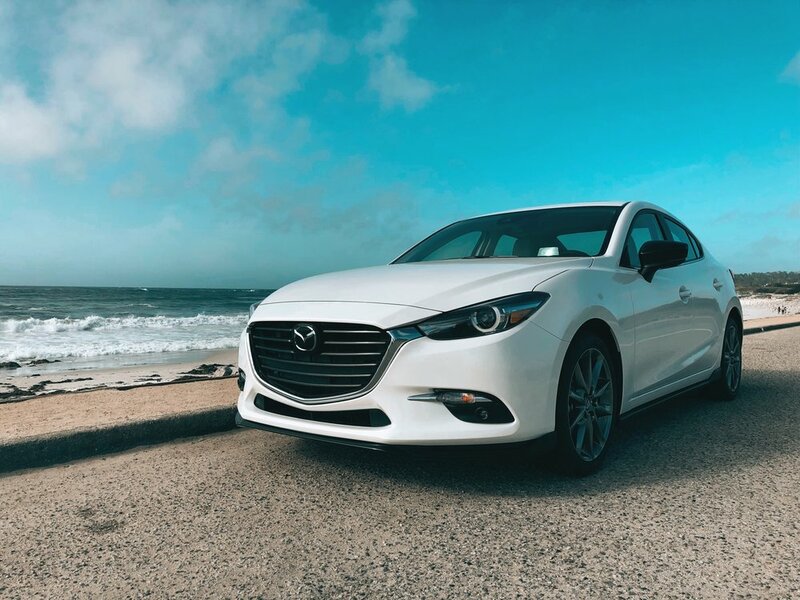 This summer, J and I traveled by car along the Central California coastline, borrowing a rental from Mazda USA. Because it came from a dealership who takes the special care to only put the best and safest cars on the road, we didn't worry too much about maintenance. But when traveling in our own vehicles (which is how we get to most of our destinations), we always do a pre-trip check. Nothing derails an exciting journey more than being stuck on the side of the road waiting to be towed to the nearest auto mechanic. Especially at night or far from home. Something as benign as a flat tire can cost you hundreds of unexpected dollars and more hours or days on your travels. A more serious issue could leave your vehicle stranded in another town. Accidents can happen. Whether you are in a rental car, your own vehicle or an UBER. But don't be discouraged from getting out on the open road. The best thing to do you can to set yourself up for success is to conduct a few easy safety checks and keep an eye out for any potential trouble. Check your filters and all fluids, including engine oil, antifreeze/coolant, windshield washer and power steering, brake and transmission fluids. Take a look under the hood and eyeball those hoses and belts. Replace if they become cracked, brittle, frayed, loose or show signs of excessive wear. These are critical to the proper functioning of the electrical system, air conditioning, power steering and the cooling system. and make sure the battery connection is clean, tight and corrosion-free. The quick and easiest of the vehicular incidents. I know because it happened to me. Check the tire pressure and tread before you get on the road for long stretches. Under-inflated tires reduce a vehicle's fuel economy and uneven wear indicates a need for wheel alignment. Tires should also be checked for bulges, nails or leaks and bald spots. to make sure it is delivering the best balance of power and fuel economy and produces the lowest level of emissions. Be sure the cap is not damaged, loose or missing to prevent gas from spilling or evaporating. Remember to secure the cap each time you get gas. In some vehicles, a loose gas cap will register as a engine problem and turning on the check engine light. Although nothing may be wrong with your vehicle, that pesky light can cause serious anxiety and waste precious time and money putting it on the rack only to discover that it was just a loose lid. If you're planning a road trip, it's important to remember that it's not as simple as just putting gas in the car and driving off. Performing a thorough inspection of your vehicle before you leave will give you peace of mind and help make your road adventure safer and more fun.